Hello Yomico Moreno! Thanks so much for taking the time to answer some questions for our magazine. Q: How long have you been tattooing? What made you to become a tattoo artist? A: It's been about 13 years since I started, I never really imagined that I was going to be a tattoo artist, I always knew that I would live from art. When I was little I always had an interest in drawing, painting, but I remember on my way home from High school there was a small tattoo shop and I stopped there every day to check out their magazines, listen to the machine and ask questions. There began my curiosity for this art. Q: Did you have any guidance from someone while you were starting? A: Unfortunately no, 13 years ago the tattoo industry was a very closed off in my country, it was very difficult to get someone to give you a tip. I used to buy magazines and read interviews to see what tattoo artists were using at the time. 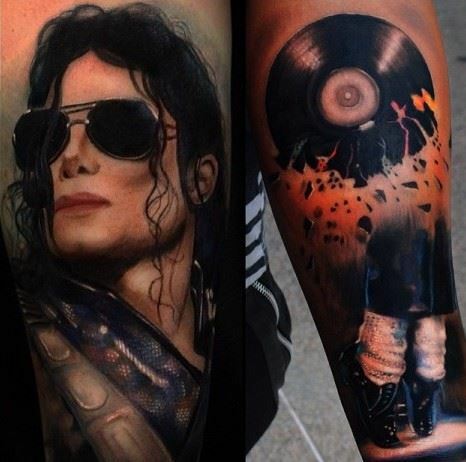 Q: You do mostly realistic tattoos, they all look amazing! Would you say that this type of work is something you enjoy the most? A: Well I’ve had to do all kinds of tattoos, from letters, tribal, Japanese, traditional, let's say all these styles helped me find my identity and understand what style I wanted to create and felt more comfortable with. If you follow this medium, realism is one of the youngest tattoo styles when compared to Japanese, letters or traditional. I love doing realism, but I feel that we have become monotonous and at this time feel the need to create good compositions beyond copying a face with a template. I feel that it’s part of the evolution of art, always looking for something beyond and it’s what I am focusing on today. 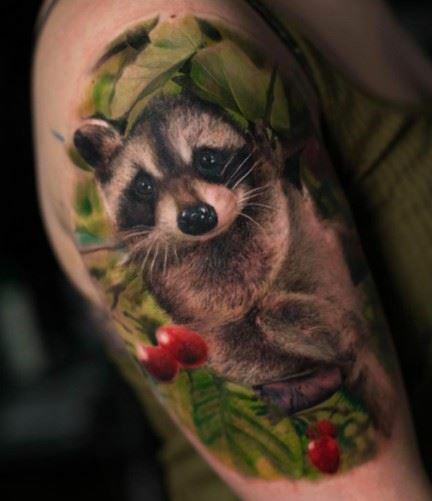 Q: Realistic tattoos, especially portraits require a very precise touch, lots of time and patience. 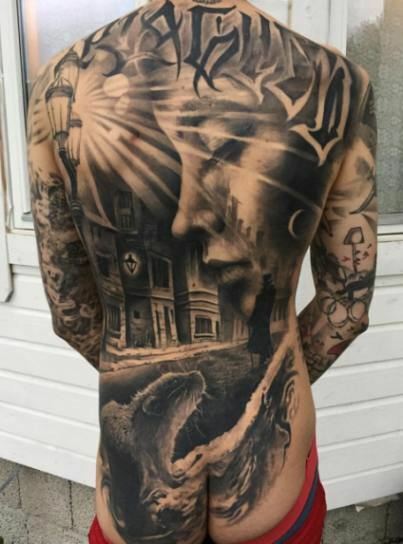 What details are the hardest to capture on skin? A: Yes, I believe that portraits are a step away from being very good portrait or a complete disaster. You have to be very detail oriented, in portraits any detail, even if small can change the overall outcome and make it look like someone else. Specially in the eyes, a misplaced highlight on the eyes can change the expression completely, every detail counts, every detail can give you a better or worse portrait. 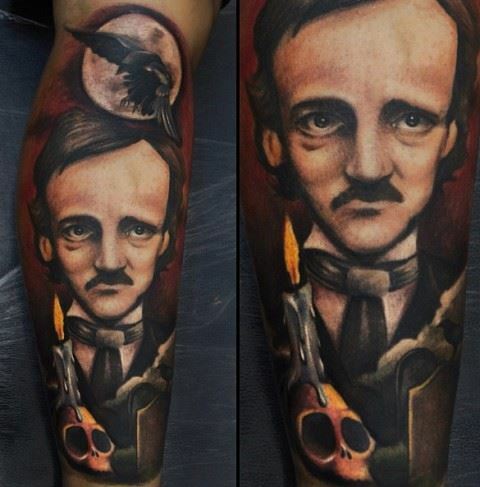 Q: I really love the Edgar Alla Poe tattoo! Realistic, but a bit modified. Was that your idea or your client's idea? 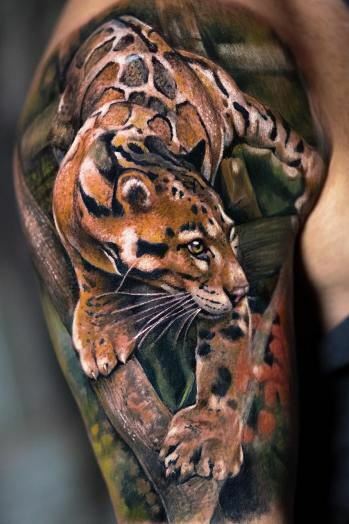 I love when realistic tattoos sometimes get a bit different outcome. A: It's what I meant before, today I'm focusing on re-interpreting my realism, maybe something more surreal. For many years I enjoyed copying the literal portrait of a photo, but there comes a time where you feel monotonous and you need to push further, where you risk re-inventing yourself, to make sure the portrait does not lose its essence, but also reflects your own artistic work. More or less that’s what I did with the Allan Poe tattoo. 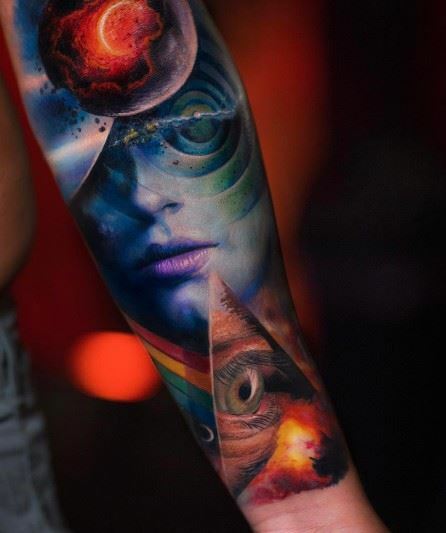 Q: Nowadays, tattoos are no longer a simple image from internet, but a lot cooler and specific. Are you always supportive to your client's ideas or sometimes you suggest your ideas? Can your clients bring some reference images? Tell me a bit about the making process. A: Yes, I always like to start with a main idea from my ​​clients. One of the things I try to make clear before starting a project, is that I need complete freedom when designing the tattoo. I explain that what I do is an interpretation of their idea with my style. I think that's the beauty of tattooing today. I remember that before clients would go to a studio, look at a book and they would choose a tattoo as if they were buying shoes, it's interesting to see that change. Today people are looking for a tattoo artist, much like an art collector, who looks for work and style of a specific artist and with this in mind, I try to get my clients to understand my work method when they decide to contact me. They aren’t just getting a tattoo, it is collecting a tattoo artist. Q: You do lots of collaborations with many artists. 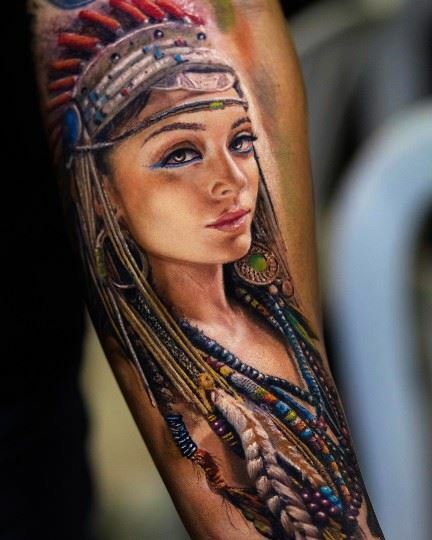 I've seen some incredible tattoos in your portfolio that are done with many other artists such as Steve Butcher, Sam Barber and many more. How much the team work help you to grow even more as an artist? A: Missing in your mention is Jak Conolly, they are not only amazing artists whom I admire and respect very much, they are my best friends, almost like my second family. When we consider going to conventions and making collaborations, we always approach it as good friends who will have fun doing what we love, is not only artistic but human growth, most of the time we rent a house where we live together for days, we talk about art, we design together, we talk about life and it's nice because we do it as a team and undoubtedly it brings a lot of growth, we inspire each other in every way, we give constructive criticism, and advise on ideas and when designing, we help each other out. I owe everything in my life to tattooing and will always be thankful for it, for giving me brothers like them. It is always good to surround yourself with people who inspire you as an artist and as a human being. Q: Tattoo Conventions are a great way to meet lots of tattoo artists and learn. How often do you visit this type of events? Do you have any favorite conventions? A: Conventions are food and knowledge for the soul, I travel a lot. I like to go to many conventions around the world, I’ve shook hands from colleague to colleague to artists that I have admired throughout my career, not only that, to be able to share a beer and chat with so many tattoo artists is undoubtedly an experience that nurtures and feeds that desire to grow and be better. I have been lucky to be able to participate in the best conventions in the world, from London, Milan, Paris, but I also like attending smaller conventions, for example in South America, where I have encountered incredible people, with great human warmth, and the truth is for me it doesn’t matter how big or small a convention is, cause I know I will see my good friends and colleagues and this always makes for a good weekend and a great experience. A: I am currently in New York. Working at Last Rites Tattoo, with Paul Booth for 2 years now. Q: Any motivational words for those who are willing to start tattooing? A: Today thanks to Tv tattooers have gone from the bad guys in films, to being protagonists, and with reality Tv and social networks, doing tattoos has become cool, nowadays everyone wants to do tattoos because they believe that they will make easy money, that they will travel the world and that they will live like rockstars, but this goes beyond that. You have to feel true passion for this, you have to sacrifice a lot, it is not only picking up a tattoo machine and making a straight line, I’ve always said that there is a big difference between being a tattooist and being a tattoo artist, anyone with a machine can be a tattooist and draw a line on the skin and make a tattoo, but the difference in being a tattoo artist, it's that you have to study what we will be done tomorrow every day. There is no tattoo university, you will never graduate as a tattoo artist, but still we study every day, we learn every day, we learn from our own mistakes, it is not a question of being a Tattooist, it is about being an artist in this field and to achieve it we need to study a lot, to understand the art, to draw, paint, design, to make many mistakes, recognize them and correct them. 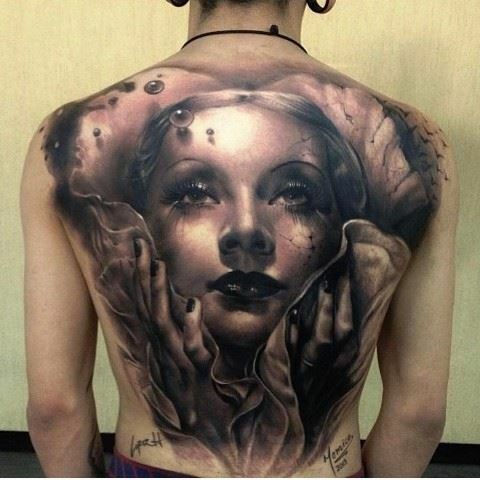 Even then we may die unsatisfied with what we do, because that is to be a tattoo artist. Ask yourself this question, How much am I willing to sacrifice for this? Only in your answer will you know where how far you can go. Thank you for the space and time and for reading this interview.